Ebenezer Rhodes described the view approximately eighty years before this photograph was taken. "From Matlock Bank many pleasing views are presented, in which the church, most romantically situated amongst groups of trees on the verge of a rock, is a beautiful feature. The undulation of the limestone strata from Church Rock to Pig Tor, at the entrance to Matlock Dale, is extremely curious, and highly worthy the observation of geologists". This picture was published shortly after the Council had opened up a walkway round the base of the rock. An amusing discussion took place in the Council Chamber in September 1902 regarding the name of the new Promenade, when Mr. Bunting queried whether the name should be Pic Tor or Pig Tor. The alternative of Lovers' Walks was suggested but one of the wags thought it too old fashioned! Only two Councillors voted for it and Pic Tor Promenade was agreed, though it was suggested that if archaeologists decided that the name was originally Pig Tor it would have to be called that. 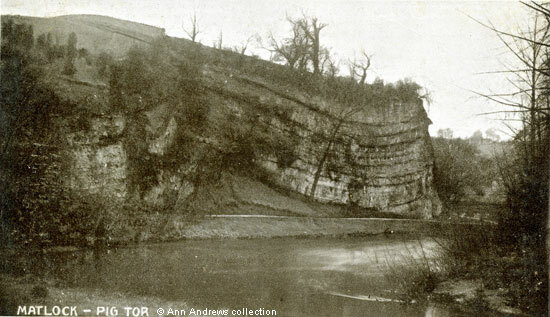 Matlock's War Memorial was erected on the top of Pic Tor in 1921 when the land was bought from Frederic Arkwright of Willersley Castle; the site was chosen so the memorial could be seen from miles around. In the collection of and provided by and information researched by and © Ann Andrews.